The Radar team has completed another development cycle. Thanks to the community for your patience, helping us test, and for giving us great feedback. This post outlines new features and information for our mainnet launch. N:N token toggle: Based on community feedback we’ve decided to implement a N:WETH interface as the default trading experience. Although our team is excited to introduce N:N, we recognize the market requires both experiences. There is now a toggle that will switch between a N:WETH and N:N interface. Trade History: A trade history section has been added to display past trades of the selected token pair. Chart: Candlesticks have been added, but may look strange until more orders are placed, especially on N:N token pairs. Pruning: More improvements to our order pruning have been made including active expired order book pruning. With these new changes comes new user flows. We put together a tutorial to help users learn how to use the platform. We are live on mainnet! We will be remaining in a beta period to test new features before our official version launch. If there are specific tokens you want listed in the next round, let us know here. Our fees will be .45% Maker and .7% Taker during our mainnet beta and will be reevaluated for our official version launch. Please note that we are still in beta and there may be problems. 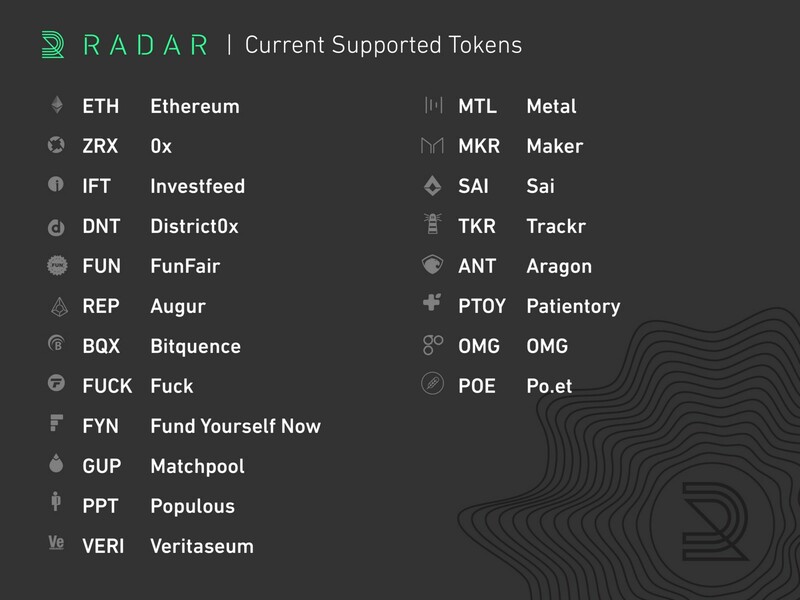 We highly recommend waiting to use Radar for large trades or if you are not comfortable with potential bugs, pauses to trading, or even undesired prices. We thank you for your patience as we work towards our official version launch. We want to extend a huge thank you to a few companies whose feedback and help has been invaluable. Infura: Thank you for going above and beyond to provide highly performant Ethereum nodes for our frontend and backend infrastructure. Øxproject: Thank you for your patience and guidance in helping us troubleshoot our technical problems. We have a Slack channel called “#beta” where we will be collecting feedback, bug reports, answering questions, and announcing changes and updates. If you are helping with our beta please join that channel.